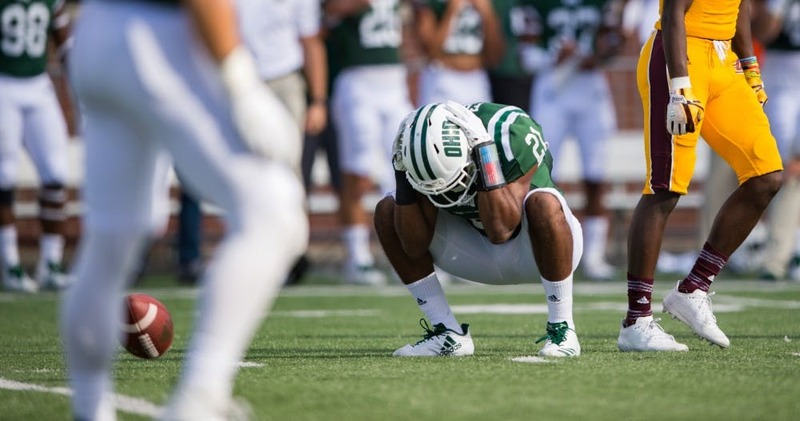 Jalen Fox grabs his helmet after dropping a possible interception pass during Ohio’s Homecoming game against Central Michigan on Saturday. Bradd Ellis thought he and Tyler Conklin were both going for the ball. After Ohio called a timeout with 2:55 left in the game Saturday, it had a chance to stop Central Michigan on third down and regain possession. Ellis defended the pass to Conklin on third down but was called for pass interference. The Chippewas gained an automatic first down, and the Bobcats were essentially finished. The Bobcats had another chance to stop the Chippewas after that, too. Javon Hagan nearly sacked Chippewas quarterback Shane Morris on a third down with about two minutes left. In their Homecoming game, the Bobcats lost 26-23 to the Chippewas. The loss snapped a three-game win streak. The penalty represented how the game transpired for the Bobcats: It was an erratic performance filled with missed opportunities. Ohio allowed 50 points last week against UMass, the most points it has allowed this season. The defense’s performance against Central Michigan was an improvement. Still, the Bobcats didn’t play well enough on defense. The pass interference and missed sack aside, the Bobcats wouldn’t have needed to capitalize on those plays had they stopped the Chippewas earlier. In the past five games, the Bobcats have allowed an average of 319 passing yards. The Bobcats struggled to defend the Chippewas’ passing attack all afternoon. The Bobcats didn’t allow any extremely deep passes — the longest they allowed was for 25 yards. Rather, it was the accumulation of shorter passes that gave the Ohio secondary fits. The defense didn’t play well enough, but it wasn’t the sole reason Ohio lost. Coach Frank Solich preaches the concept of playing well in each component of the game: offense, defense and special teams. The Bobcats didn’t play well in either of those facets of the game, but their offense perhaps played the worst out of the three. Quarterback Nathan Rourke committed four turnovers: three fumbles and one interception. Ohio’s offense couldn’t establish a rhythm because of the turnovers. The unit’s performance was mediocre, especially considering it has shown improvement. The Bobcats were ranked No. 2 in the Mid-American Conference for points per game (41.4) before playing the Chippewas. Despite the team’s turnovers, though, Solich hopes this game is an aberration, a mere blip in Ohio’s season. Ohio will head to Bowling Green next Saturday, so it has a chance to show why its performance against Central Michigan was unusual.